Big Data - News, Views and Reviews: Big Data Answers - What does the Chinese government censor? What members of congress do? 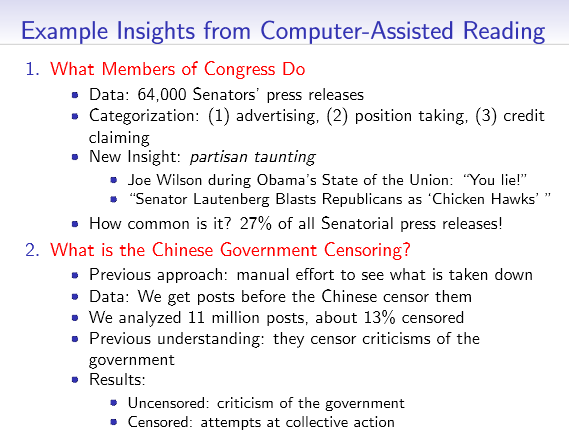 Big Data Answers - What does the Chinese government censor? What members of congress do? In keeping with my intent to present lighter side of big data on the weekends, this week I have chosen one slide taken from the talk given by Gary King last week. The talk is titled "Big Data is Not About the Data!" and it was delivered at Institute for Quantitative Social Science in Harvard University.